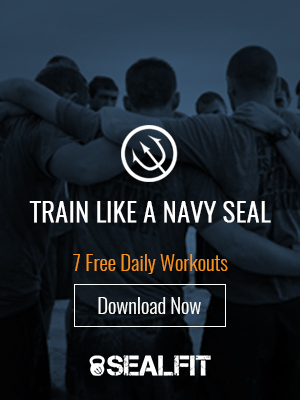 A couple weeks ago, I reviewed what I called “McRaven’s 10” which are ten principles that Admiral McRaven (Commander of the US Special Operations Command) derived from SEAL indoctrination training (BUD/S) that if followed, will allow you to change the world one person at a time…starting with yourself, of course! SEALFIT Coach Lance Cummings was conducting Close Quarter Combat training when one of the SEALs had a dangerous accidental discharge. The reaction of the platoon was anger and outrage at his careless move – which only narrowly avoided a fatal shot to one of the operators. They looked to the officer in charge, expecting him to immediately dole out a harsh sentence. Instead, the platoon leader said he would deal with it later, then went and took a nap. After snoozing like a baby the leader emerged and had a conference with the perpetrator. The action he took balanced punishment with remedial opportunity. The platoon’s respect for the leader was enhanced because they noted that he did not react immediately with a disproportionate response – which was typical in the military. The nap had allowed the emotions of the event to settle and provided the officer with valuable time to think through the second and third level consequences of punitive options. It also allowed for his intuition to engage in the decision process. Overall the result was a much better solution. So if you want to be a Kokoro Leader, take a nap, and then make the call! We were conducting “rubber duck” training where the team would parachute into the ocean from a C-130 with a Zodiac boat. The boat was rigged with crating beneath and a parachute above to allow it to float to the ocean and land unharmed. My platoon spent hours preparing our duck. Inside went the outboard engine, gas, and our dive rigs. The rigging of the chute and protective wrap was meticulous. The whole team got into the act, including me. It was a classic Zen moment of all hands working in harmony. A sister platoon was also performing the duck drop. I noted without much thought that there were only a couple guys building the duck – they seemed hurried. The rest of the platoon was upstairs in the team room doing other planning and preparation. Their duck was done in the same time as ours, but with one third the manpower. I wondered why ours took so much longer. Three hours later we were in the air above the Pacific Ocean. The warning light came on notifying us that it was game time. We checked our teammates chutes, the riggers gave the duck one last scan, and then they shoved the duck off the ramp. We ran into the air behind it. The parachute on the duck deployed (as did ours, thankfully) and it floated to the ocean and splashed down. All gear intact. Then the bird came around for a second pass to drop the other platoon. I watched as their duck left the ramp followed by the jumpers. But when their duck hit the surface, it exploded, strewing the motor and gear into the ocean. Later our platoon chief took a moment to praise the team for attention to detail with the preparation of the duck. He did not ding the other platoon, but his message was clear – never shortchange the prep work on your gear…it can make the difference between success and failure, or life and death. So if you want to be a Kokoro Leader, then take care of your gear so it can take care of you! In first phase of BUDS training the students must demonstrate their confidence in the water with an event called “drown proofing.” The instructors tie the student’s hands and legs together, and then have them bob in the deep end of the pool. If they pass this test they are then required to swim 100 meters with hands and legs tied. This event may seem like another SEAL mind game, but it had a very realistic beginning. In the Vietnam conflict a captured pilot was able to escape and evade his captors while being marched to the prisoner camp. He found himself at a rivers edge with his hands tied behind his back; bad guys close on his heels. So he jumped in and improvised, swimming like a porpoise using his head and feet. He survived to tell the tale. The SEAL instructors thought it was pretty cool story and decided it should be part of their training. Bottom line: when confronted with a situation where you don’t have the usual tools, you must improvise and take bold action to succeed. So if you want to be a Kokoro Leader, when someone ties your hands, use your head! In free fall parachute training, many senior officers will use a parachute packed by a qualified member of the team. Most of the time this works out fine. But I never liked this approach. I was always left hoping that the rigger did it right, and whether I was about to become a statistic due to someone else’s screw-up. I wanted more control over the circumstances, so I insisted on packing my own parachute. In fact, this was standard operating procedure for the SEALs. With over 300 jumps I never had a problem, and many of my teammates had over a thousand jumps with few issues. When you let someone else handle a mission critical task, then you had better understand the ramifications of what happens if they mess up. It is certainly important to delegate and trust, but you must also have the wisdom to verify that the task they performed will lead to mission success. The only way that you can verify at that level is if you know how to do it perfectly yourself. When it comes to high-risk actions, it is best to either do it yourself or make sure you are qualified to verify the actions of the doer. Thus, I say to be a Kokoro leader, you must learn to pack your own parachute! My Commanding Officer at SEAL Team THREE was Commander McRaven. On one occasion he decided to participate in a platoon’s readiness mission. The platoon was to enter Morro Bay on the California coast via Rigid Hull Inflatable Boat (RHIB) and send swimmers ashore. After several hours pounding through the surf along the coast they reached the rally point outside the surf. Swimmer scouts were sent to check the surf risk to the RHIBs. They came back noting that the conditions were not good. Commander McRaven boldly decided to proceed with the mission, and both boats went end-over in the surf. Bodies and equipment were vaulted into the ocean and the boats lie upside down inside the surf zone. Fortunately nobody was badly injured, but the mission was aborted. Many could critique the Commander’s decision that night. It was a bold call that didn’t turn out well. But he was a wise man and learned some valuable lessons – about the boat’s capabilities and about he and his team. He put those lessons immediately to work and helped craft new ways to insert into enemy territory from the sea. Later, Commander McRaven was promoted to Captain, then Admiral and is now in charge of the entire special ops community. He is a Kokoro leader who learned early on that he who dares, wins. Hope you can put these principles to work in your own life and begin to merge your heart and mind in your actions to become a Kokoro leader. When both heart and mind are engaged, our actions become more powerful, purposeful and connected. And that leads to better results. Train hard, stay focused and dare to win. Hooyah!